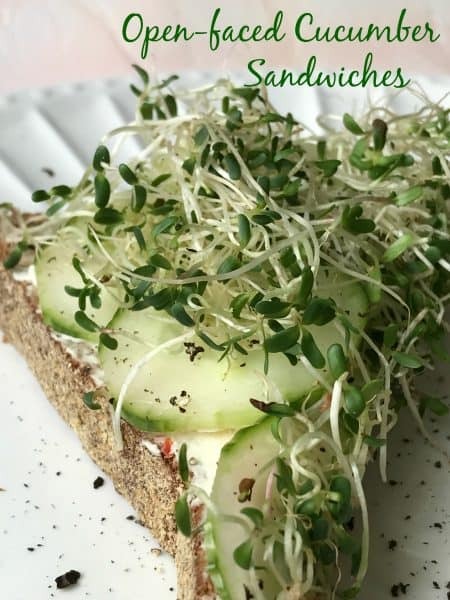 Looking for a crisp and light cucumber sandwich? Then this sandwich is what your looking for. 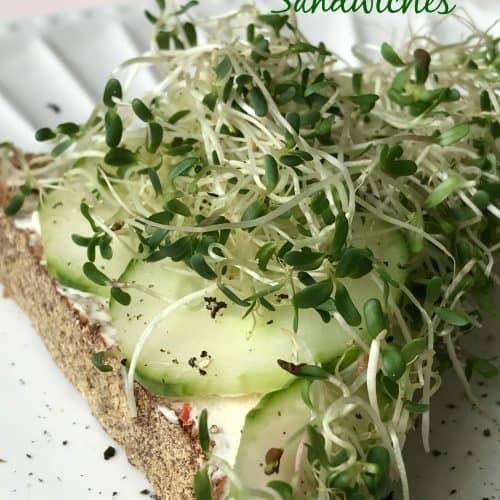 Made with a purchased loaf of barley rye bread, reduced-fat spreadable garden vegetable cream cheese, paper thin slices of English cucumber and then topped with Jack & The Green Sprouts alfalfa sprouts. 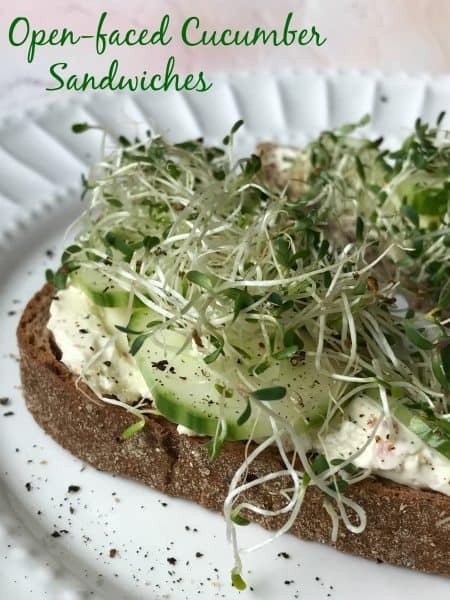 A Wisconsin based sprouts company that has been in the business of sprouts for over forty years. English Cucumbers are usually more expensive than the garden varieties. They can grow up to 2 feet long, are thinner in circumference than their garden cousins and are virtually seedless. Purportedly burp-less, they’re marketed shrink wrapped in plastic. All cucumbers are available year-round, with the peak season May to August. 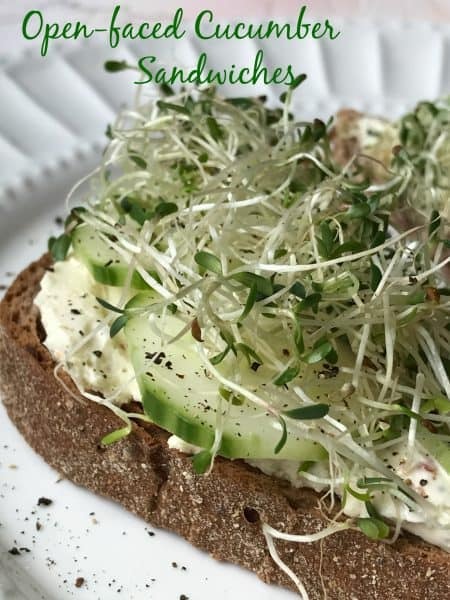 This refreshing open-faced cucumber sandwich is oozing with fresh flavors. Open-faced is a descriptor used culinary for a “sandwich” consisting of one slice of bread topped with various ingredients such as sliced meat, cheese, pickles etc. Open-faced sandwiches are very popular in Scandinavia, where they’ve become an art form with elaborately arranged and decorated combinations. For the most part, open-faced sandwiches are cold but there are also hot varieties such as: bread topped with meat slices and gravy. Open-faced cucumber sandwiches are perfect to serve as an appetizer at parties and showers. Purchase a small party loaf of whole wheat or rye bread and scale down the sandwiches. It’s possible to also make the sandwiches with regular size bread to serve as appetizers. After toasting the bread, cut off the crusts and proceed with directions, cutting the sandwiches into four pieces. Recipe Tip: Toasting the bread slices first and then allowing the slices to cool on a wire rack or standing the slices upright before spreading with vegetable cream cheese spread, will keep the slices from becoming soggy. Stand two slices of bread upright and lean the two slices together, tepee style. This is my favorite way to cool bread slices. This tip works great for all sandwiches/appetizers that might need to ‘sit’ during serving time. Are crisp, tender sprouts of various germinated beans and seeds. Mung bean sprouts, used often in Chinese cooking, are the most popular. However, other seeds and beans such as alfalfa, soy bean and wheat berries may also be sprouted. Sprouts are best eaten raw but can also be stir-fried or sauteed. Sprouts are available year-round in most large supermarkets. 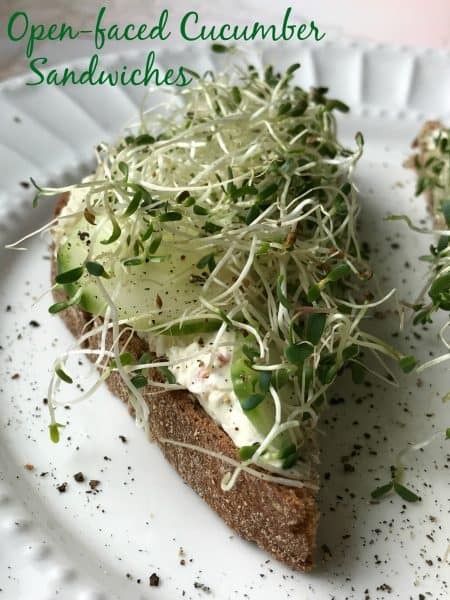 Delicate sprouts, like alfalfa sprouts, should be refrigerated in the ventilated plastic container in which they’re sold and kept no more than a few days or by the ‘used by’ date. 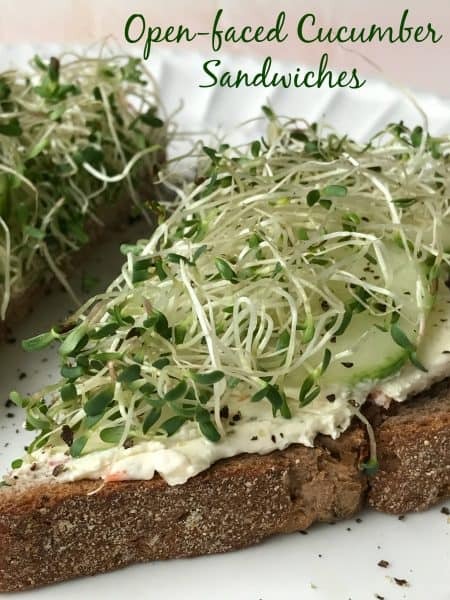 A delicious sandwich perfect as an appetizer or light lunch. Spread toast with cream cheese. 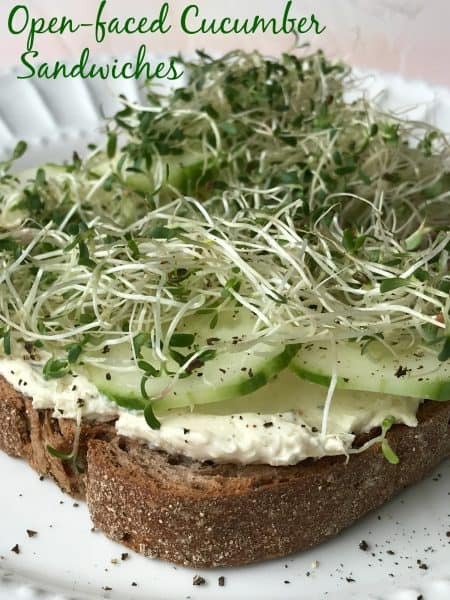 Top with cucumber slices, sprouts and coarsely ground pepper. Serve these tasty sandwiches with Special Stuffed Strawberries for an added treat. Cranberries are only in season from early fall through December. When buying fresh cranberries, look for packages with shiny, bright red, light or dark berries. Avoid berries that are bruised, shriveled or have brown spots. Cranberries freeze great, so buy a few extra bags to use throughout the year.